UCLA founded the College of Business Administration in 1935. Originally, the school taught vocational business skills, such as typing, shorthand, and penmanship, to people who would be teaching others. In 1936, the school earned national accreditation, and in 1939, the MBA degree was authorized. The program was renamed the John E. Anderson Graduate School of Management at UCLA in 1987 in honor of Anderson’s $15 million gift to the program. UCLA Anderson School of Management is a beautiful complex located in the north/central section of the UCLA campus, near the intersection of Sunset Boulevard and Westwood Plaza. The Admissions Office for the MBA program is located in Gold Hall, Suite B201. The main campus is only 20 minutes away from the Los Angeles International Airport. UCLA Anderson School of Management moved into a graceful complex of seven brick and glass buildings in 1995. The complex was designed by Pei, Cobb, Freed & Partners, who also created a master plan for the future development of the UCLA campus. The seven buildings of the complex, spanning 284,753 square feet, were designed to resemble an Italian village with a series of courtyards and bridges to create an “academic village.” The Marion Anderson Courtyard is surrounded by four of the school’s six buildings. It is the heart of the UCLA Anderson community and invites personal interaction. Visual corridors to the south and east connect the courtyard with the UCLA campus. The Anderson School of Management employs more than 150 full-time faculty members, emeritus faculty, visiting scholars and program advisors who teach across nine academic concentrations, including: Accounting, Decisions, Operations & Technology Management, Finance, Global Economics and Management, Management and Organizations, Interdisciplinary Group in Behavioral Decision Making, Marketing, and Strategy. Each year, UCLA Anderson faculty members publish papers in leading scholarly journals, receive recognition for research excellence, provide leadership in and beyond UCLA, and serve as inspirational teachers and mentors. 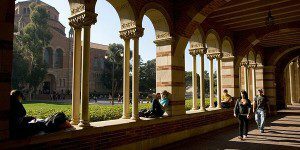 UCLA Anderson School of Management provides management education to some 1,600 students enrolled in full-time, part-time and executive MBA programs, and doctoral programs. Anderson School of Management offers a full-time, two year MBA program, as well as a part-time MBA, Executive, and Global Executive MBA programs.